NetScaler MobileStream™ technology from Citrix enables enterprises to do more than simply get by when it comes to the performance and security of mobile workspaces. Building on the gains derived from the core set of NetScaler functionality, NetScaler MobileStream combines a suite of multi-layer optimizations purpose-built to accelerate mobile service delivery with an essential collection of secure access and threat protection capabilities for mobile computing. The result is a unified solution that not only provides the peace of mind IT needs but also delivers the exceptional mobile experience your employees, customers and partners deserve. 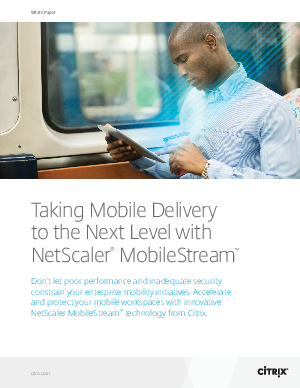 Put another way, the result with NetScaler MobileStream is a dramatic improvement in mobile service performance and protection that makes Citrix NetScaler® the world’s fastest and most secure delivery platform for mobile workspaces.